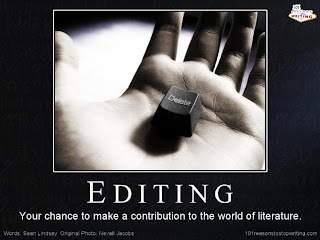 Diary of a Nothingist: Things I've learned while editing. Things I've learned while editing. I like using the word 'predicament'. A quick search of novel currently undergoing edits revealed an embarassingly large amount of predicaments. I love the search and replace function. Ditto for 'clearly'. Clearly, I like using clearly. Action scenes need to be fast-paced. The reader doesn't need or want to know what the hero is thinking, just what he's doing (and doing it in short snappy sentences). Names are important - especially in translation. Apparently Cal means something quite impolite in Russian (so there). Love the photo. And, the find/replace function!